If you haven’t heard of bilberry fruit, you shouldn’t be surprised. The plant is extremely difficult to grow, and since it bears small fruit it is seldom cultivated. The fruit that does exist is primarily from wild plants that grow throughout northern and central Europe where they are more plentiful. In fact, it’s often called European blueberry. For comparison, bilberries are similar to blueberries and huckleberries, but smaller and with a fuller taste. Like most natural foods, there are a number of health benefits associated with this berry, the most notable being improvement in eye health. British pilots during World War II actually ate bilberry jam before night raids in order to improve their vision. When you take a closer look at the berry, this bit of war lore is not too surprising. According to the book "100 Super Supplements for a Longer Life," by Frank Murray, bilberry health benefits include protecting collagen structures found in the eyes. Bilberry can also prevent and treat macular degeneration and retinopathy. The anthocyanosides found in bilberry are known for their ability to help nourish and repair the tiny capillaries within the eye. While eye health is a top benefit of bilberry, the benefits don’t stop there. Bilberry is also used to help improve cardiovascular health. According to a paper on bilberry written for the Center for Holistic Pediatric Education and Research by Dr. Kathi Kemper, bilberry can improve circulation and protect against circulatory-related disease. Dr. Kemper suggests that bilberry can also improve atherosclerosis and varicose veins. In addition, the bilberry bioflavonoids are beneficial to the connective tissue that lines blood vessels and binds ligaments throughout the body. The plant is also an excellent source of antioxidants containing both anthocyanosides and Vitamin C. These antioxidants work to repair and reverse damage to cells from free radicals. This is one of the reasons you’ll find it as an ingredient in Jon Barron’s Ultimate Antioxidant formula. Traditionally, the leaves and the berries have been used to help with scurvy, urinary tract issues or challenges, kidney problems, and diarrhea. And it’s for all of these reasons that Jon Barron uses bilberry leaf (listed on the label as European blueberry leaf) in his Accelerator high-energy, fuel-supplement shake formula. There are a number of ways to consume this plant to take advantage of the many bilberry health benefits. In fact, in Poland, bilberries are put into sweet buns as a filling (such a bun is called a jagodzianka, and it is one of Poland’s most popular bakery products during summer). It can be harvested naturally from forests and eaten fresh in jams or other dishes. The fruit can also be dried, used in tea, or found in pill form. For those without access to the fruit and looking to supplement, look for an extract standardized to 25% anthocyanins. 120 mg a day should suffice. 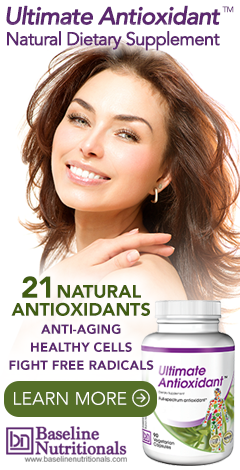 For more information, take a closer look at other natural antioxidants. Amazing, extremely well researched information.